A porous, deformable sponge-like material made from ceramic nanofibers displays remarkable heat resistance. Here, flower petals are heated atop 7mm-thick discs of varying materials. After heating the materials from the bottom at 400°C, the petal atop the ceramic sponge is barely wilted, while the others are burnt to a crisp. Image: Gao/Li/Wu/Brown University/Tsingua University. "The basic science question we tried to answer is how can we make a material that's highly deformable but resistant to high temperature," said Huajian Gao, a professor in Brown University's School of Engineering. "This paper demonstrates that we can do that by tangling ceramic nanofibers into a sponge, and the method we use for doing it is inexpensive and scalable to make these in large quantities." The work, a collaboration between Gao's lab at Brown and the labs of Hui Wu and Xiaoyan Li at Tsinghua University in China, is described in a paper in Science Advances. As anyone who has ever dropped a flower vase knows well, ceramics are brittle materials. Cracks in ceramics tend to propagate quickly, leading to catastrophic failure with even the slightest deformation. While that's true for all traditional ceramics, things are different at the nanoscale. "At the nanoscale, cracks and flaws become so small that it takes much more energy to activate them and cause them to propagate," explained Gao. "Nanoscale fibers also promote deformation mechanisms such as what is known as creep, where atoms can diffuse along grain boundaries, enabling the material to deform without breaking." Because of those nanoscale dynamics, materials made from ceramic nanofibers have the potential to be deformable and flexible, while maintaining the heat resistance that make ceramics useful in high-temperature applications. The problem is that such materials aren't easy to make. One commonly-used method for making nanofibers, known as electrospinning, doesn't work well with ceramics. Another potential option, 3D laser printing, is expensive and time-consuming. So the researchers turned to a method called solution blow-spinning, which had been developed previously by Wu in his lab at Tsinghua. This process uses air pressure to drive a liquid solution containing ceramic material through a tiny syringe aperture. As the liquid emerges, it quickly solidifies into nanoscale fibers that are collected in a spinning cage. The collected material is then heated to burn away the solvent material, leaving a mass of tangled ceramic nanofibers that looks a bit like a cotton ball. The researchers used this method to create sponges made from a variety of different types of ceramic and showed that these materials possessed some remarkable properties. For example, the sponges were able to rebound after compressive strain of up to 50%, something that no standard ceramic material can do, and could maintain that resilience at temperatures of up to 800°C. The research also showed that the sponges had a remarkable capacity for high-temperature insulation. 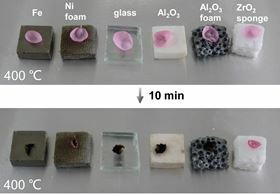 In one experiment, the researchers placed a flower petal on top of a 7mm-thick sponge made from nanofibers of titanium dioxide (a common ceramic material). After heating the bottom of the sponge to 400°C for 10 minutes, the flower on top barely wilted. Meanwhile, petals placed on other types of porous ceramic materials under the same conditions were burnt to a crisp. The ceramic sponges' heat resistance and deformability make them potentially useful as an insulating material where flexibility is important. For example, Gao says, the material could be used as an insulating layer in firefighters' clothing. Another potential use could be in water purification. Titanium dioxide is a well-known photocatalyst, able to break down organic molecules and thus kill bacteria and other microorganisms in water. The researchers showed that a titanium dioxide sponge could absorb 50 times its weight in water containing an organic dye. Within 15 minutes, the sponge was able to degrade the dye under illumination. With the water wrung out, the sponge could then be reused – something that can't be done with the titanium dioxide powders normally used in water purification. In addition to these applications, there may be others that the researchers haven't yet considered. "The process we used for making these is extremely versatile; it can be used with a great variety of different types of ceramic starting materials," said Wu, one of the corresponding authors from Tsinghua. "So we think there's huge prospect for potential applications."